Snakes and spiders and bees, oh my! Every conceivable animal and insect was on the attack in the 1970s. Certainly a popular theme in the '50s (mostly attributed to atomic radiation), it was perhaps the success of Willard that spawned this trend. Whatever the impetus, the "nature attacks" subgenre joined the ranks alongside the Irwin Allen type disaster movies of the same era - and became a fun and reliable cycle. Rats, frogs, ants, bears, and of course sharks...they all got into the act. With all the talk at the time about a South American bee swarm heading towards the United States, there were several films involving the pesky critters. Killer Bees, The Bees and The Swarm (even master of disaster producer Allen jumped on the bandwagon) were all made in an effort to maximize the thrill factor of current events. But none came close to director Bruce Geller's The Savage Bees, a Made-for-Television effort that originally aired on November 22, 1976. Accidentally transported to the States on a banana boat from Brazil, the deadly bees first make their mark on a town twenty miles outside of New Orleans. Sheriff Donald McKew (Ben Johnson) finds his dog dead. Believing the pooch was poisoned, the sheriff drives into the city to have the coroner examine the animal. New Orleans is alive and buzzing with Mardi Gras. Performing an autopsy on a pet is an unusual request but the assistant medical examiner, Jeff DuRand (Michael Parks), obliges. He discovers that the dog died of toxic paralysis...and its stomach is full of bees. Jeff places a call to Jeannie Devereaux (Gretchen Corbett), an entomology expert, who thinks it's strange indeed that this type of insect attacked a dog. She tells him to meet her at her lab. Meanwhile...even though bodies begin to turn up at the morgue, the police department is reluctant to get involved. At the lab, Jeannie examines a specimen taken from a man who was stung hundreds of times. There are enough toxins are in his body to kill an elephant. Jeannie tells Jeff that it could not be the work of normal North American bees. They visit with Dr. Rufus Carter (Paul Hecht) at the National Bee Stock Center. The doctor shows them a film made by a Dr. Jorge Meuller (Horst Buchholz) that explains why the Africanized bee was brought to South America for an experiment - and how they escaped from captivity, killing scores of people. The facts are frightening. Most honeybees attack only to ward off invaders. Africanized bees attack when annoyed by color or sound...and they will pursue quarry for as long as twenty-four hours. A farmer is killed, despite his attempt to stay underwater in a bayou. And a little girl is missing, presumed dead. Sheriff McKew does his best to mobilize his men but the insects are heading towards New Orleans. Jeannie and Jeff meet with Deputy Mayor Pelligrino (James Best) but there is no sense of urgency on his part. Dr. Meuller flies in from Brazil with a plan to replace the queen bee with a new queen...which will produce hardworking and non-aggressive offspring. He locates the bees in a food stand and the area is blocked off. The Brazilian doctor approaches the swarm wearing a protective suit - while Jeannie sits in her car relaying the situation to Jeff on a walkie-talkie. But things go horribly wrong when two Mardi Gras revelers break through the roadblock and get out of their car. As a helpless Jeannie looks on, the bees attack the couple...killing them. Dr. Meuller, whose protective suit is accidentally torn, loses his life as well. In anguish, Jeannie rests her head on the steering wheel and sets off the horn. The noise instantly attracts the bees and they completely cover her Volkswagen Bug. Bees are immobile at 45 degrees Fahrenheit and there is only one solution: Jeannie is to drive her car into the Superdome, where the temperature can be lowered. Although Jeannie can barely see, Jeff directs her and clears the streets of New Orleans as she drives through the city at fifteen miles per hour. The car stalls just outside the stadium and Jeff's vehicle pushes the car the rest of the way in. Soon, the temperature is dropped enough to immobilize the bees and they fall to the ground. The threat is over...at least for the moment. 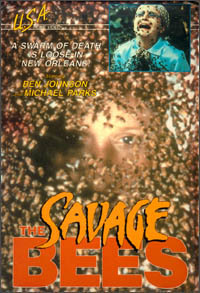 The Savage Bees was so good, a sequel was made in 1978. Terror Out of the Sky is not nearly as well regarded as its predecessor, but is still worth checking out.